Like Apple, Samsung is trying to link its devices so they work better together. A new effort bridges the gap between the company's Android handsets and Windows devices. A new feature called Flow in Samsung's new Galaxy TabPro S helps the Windows 10 tablet work smoothly with Galaxy smartphones running Android. The super-thin tablet started shipping in the U.S. on Thursday, with a starting price of $899. Until now, Samsung's Windows PCs and Android devices didn't work hand-in-hand. Flow provides some interesting hints on Samsung's plan to link Windows and Android devices. Flow will allow Android smartphone users to use their devices to log in to Windows PCs. Users can swipe a finger on a smartphone's fingerprint reader, logging a user into the TabPro S, which doesn't have a fingerprint reader. Similarly, users can log in to the TabPro S by pattern authentication -- by drawing specific shapes -- on smartphones. Those actions require a Flow application on a smartphone, which passes on authentication information to the TabPro S through NFC protocols. Flow will also allow notifications of phone calls and text messages on Galaxy smartphones to also appear on the TabPro S. This was not possible on earlier Samsung PCs. It's a feature drawn from Samsung's Gear smartwatches, which can show smartphone notifications. Flow also links the TabPro S to a mobile Wi-Fi hotspot on a Galaxy smartphone. The TabPro S screen can be mirrored on Samsung TVs. Samsung's smartphones already work well with the company's TVs. Samsung is working hard to ensure its devices talk to each other. The company is building smart appliances like refrigerators and washing machines that could be controlled through smartphones. But trying to make Windows work with Android creates a whole new set of challenges due to differences in codes and protocols. There are many possibilities with Flow, but Samsung hasn't determined what additional features will be built into it, a company spokeswoman said at a press event in New York City. 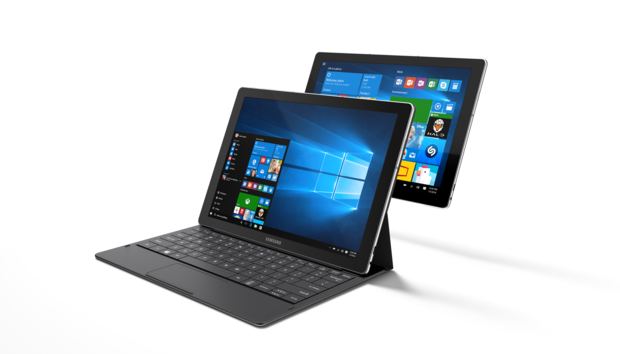 The Galaxy lineup is dominated by Android smartphones and tablets, and the TabPro S is the company's first Galaxy Windows tablet. The $899 entry-level price is the same as Microsoft's base Surface Pro 4 model, which has a similar configuration, with an Intel Core M3 chip and 128GB of storage. The tablet is is 6.35 millimeters thick and weighs 680 grams. A highlight of the tablet is a Super AMOLED display that shows pictures at a resolution of 2160 x 1440 pixels. OLED screens are more vibrant than conventional LCD/LED screens and also more power efficient because they don't include backlighting.